Maintaining weight is a discussion kept for another day. Here, we are talking about the “nerd fitness”. Yes, you read it right. The question of physical fitness among geeks has been highlighted poignantly over the time. Most of the techies or bloggers live a sedentary lifestyle. Being glued to a desk in front of the machines face, many of them face health issues sooner or later. Prolonged sitting at the computer not only affects your mind but the body as well. Poor sitting posture may lead to a backache issue, anxiety, discomfort and weight gain from lack of movement. According to research, sitting too long & sedentary lifestyle could lead to heart deceases, diabetes, etc. Overuse of computers cause some physical afflictions, such as eye strain, Scoliosis, vision abnormalities, Carpal Tunnel Syndrome, headache, and backache – especially if you are over 40. They can damage the mental health of an individual too. And so it is important that you know how to sit in from of the computer. Expert suggests that taking frequent breaks from your desk job, move around for 5-10 minutes may be enough to counter the health risk. Unfortunately for some people, even taking out 5 minutes and avoid sitting becomes very difficult. And the ugly truth is that the few of our body components aren’t meant to be sedentary. So if you are not able to find out dedicated time for the workout then try to merge fitness into your geeky lifestyle. 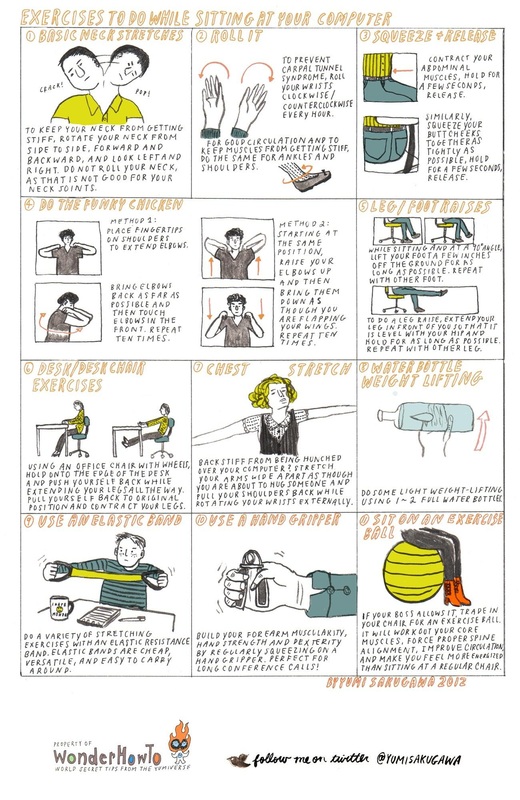 Hence, we have curated few easy ways to exercise while sitting at your computer. Regular stretching relieves stiff muscles and creaky joints. It helps in getting rid of back pain and also ensures the right posture by keeping your muscles loose. Stretching at work won’t take much away from your busy schedule. Just put down the mouse, take off the earphones and unfold yourself. To keep your neck getting stiff, rotate it from left to right, up and down. For the entire body, stand straight, hold up your arms and bend backward pushing the body out. Also, you can push your arms behind your back and pull them back to stretch your chest. Extend your legs while pushing them towards toes. Lean back and take rest at the back of the chair. Then hold chair tight and lift your legs up and then fold them towards your chest. Keep doing it quickly as much as you can and engage your core muscles. This kind of movement helps you get rid of back problems. Another way of doing exercise while sitting on your computer is to sit up with a straight back. Open your legs and extend your arms and start moving them in the form of jumping jacks. This movement engages core muscles, build endurance and get your blood flowing. Another core and leg exercise is to sit on the edge of your chair, place your hands on the chair’s extreme back and press your body down and then up. This is another way of doing arm press using your office chair. Try to do at least 20 reps initially; increase the number eventually. Forget the fear of looking odd one out. First of all, you need to understand that your health is the priority. While standing, you can do squats, stretches, lunges, wall push-ups and yoga moves without leaving your desk. Place your palms on the shoulder and extend elbows. Move elbows in circulation while touching them in the front. This exercise removes neck and shoulder’s stiffness. Next exercise you can do at work is lunges. The lunges are easy to learn and pretty safe to implement even without supervision. To perform lunges, you need to keep your body straight, step forward with one leg while lowering the body down and then take the next step in a similar fashion. You may consider them reminiscent of our school days, but they are one best exercise you can do at work. It is a full body exercise which wakes up every muscle group. You just need to jump; hands should be raised up and clap overhead while moving the foot apart simultaneously. Merely doing it for 5 minutes can dimish your sedentary work life and provide you with multiple health benefits including weight loss. Bonus! Don’t be a couch potato! Move whenever possible. Be it a short coffee break or just a break from the desk, make use of it. It not only breaks the monotony but takes you out of the apathetic state. You may not see the immediate results, but walking surely improves your mood, balance, and coordination. TIP: Take forced breaks to relax you using CareUEyes or Pause4Relax software. Don’t make climbing stairs an option only if the lift or elevators aren’t working. This form of exercise is not only good for the body but also good for heart health. Climbing the stairs lowers the bad cholesterol levels, improves overall health, and decreases the risk of various ailments that can affect your work life. This Infographic from Wonderhowto illustrates very nicely some of the exercises you should regularly be doing. You may click on the image to see it in the larger size. Even if the gymming is not part of your daily routine, take the efforts maintain your health. And the best part is, you don’t need to pay anything or buy any expensive equipment. These exercises cancel out the negative effects of prolonged working hours spent in a chair. Although, many companies have health, fitness, and wellness initiatives in place. However, it is always the individual’s effort that prevails and counts. What exercises you do in your workplace or things you do to de-stress yourself? Please let us know in the comment section below; we would be happy to learn your experiences. 5 health issues, every over 40 computer user should be aware of!